“I considered many childcare options for my daughter when I had to go back to work after four months of maternity leave. When I discovered Strong Start and learned about the Reggio Emilia method, where they provide ample hands-on learning and opportunities for the kids to really explore the subjects they’re curious about, I immediately put my name on their waiting list. I couldn’t imagine my daughter in another program! I was fortunate enough to get a spot for her and can’t say enough about how incredible Strong Start, the program, teachers and staff are. It might be trite, but I truly feel like they are all an extension of our family. I gush about Strong Start to new parents and anyone else who will listen. Your child will thrive in this environment — it’s impossible not to! Both my kids (2 and 4 y/o) attend Strong Start. It was a very difficult decision for me to switch my kids over from a different school that I really liked but I was looking for something more structured and closer to home. When we moved to Trumbull a couple of years ago I visited every single school in town that offered infant thru pre-k programs and was not impressed with any of them so we ended up enrolling our kids in a school in Shelton. I think Trumbull has many very good preschools (3+) but we needed a school for my infant and my pre-schooler. Strong Start definitely filled this void perfectly when it opened. Personally, I did not want a ‘chain school’ and I also wanted a school that prepared my kids to how kindergarten will be (class size and activities). I think Strong Start is the perfect compromise as it its a large school with very structured programs but the owner is right on site and I do not have to deal with a ‘corporate office’. My kids adjusted perfectly from day one. The teachers and staff are great. They are very organized and have fun activities planned for the kids every day. It is just obvious both my kids look forward to going to school every day. No matter how many positive things I can share with you about our experience with Strong Start, it doesn’t even begin to express my appreciation, gratitude, and confidence that this was the best place I could have found for my son. The entire staff has made us feel welcome, and taken the time to get to know my son and what makes him smile. 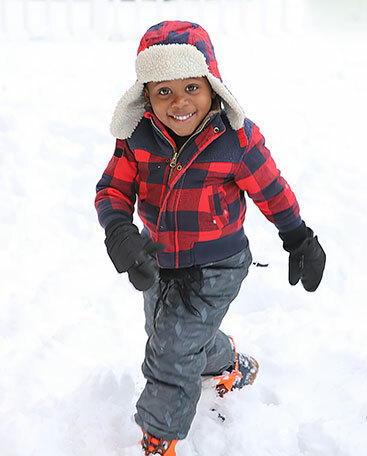 They have helped him grow through not only a well-planned, age-based explorative play and learning curriculum, but also through their tireless love, warmth and kindness. I am a working mom, so it can be hard to leave your little one, but I can honestly say, it makes it that much easier when you’re leaving him with people who will love him, teach him, push him to be the best version of himself, and give him a great big hug if he needs one. I cannot say enough wonderful things about Strong Start! I wanted reliable and thoughtful care for my daughter and have been continually impressed by my expectations being exceeded. Her teachers are so kind and loving toward her and she has such rich learning experiences at school. Drop offs are a breeze and she often doesn’t want to leave because she’s having so much fun! Communication is also very easy between teachers as well as the front office. Lastly, the facility is top notch! Super clean, safe and fun! Thank you to Marc and the staff at Strong Start. You are truly passionate about what you do and it shows! We researched several Preschools in the area for our twin boys before we were fortunate enough to find Strong Start. From our first contact with Marc, via phone, to our tour and interview we were impressed with this school. We love their philosophy and the inquiry based curriculum as well as the teacher to child ratio. Our sons had never been in any form of day care and went from being at home with us to Strong Start. The transition went very smooth thanks to Marc and their teachers. They love their teachers and all of the other staff. The layout of the school is welcoming and makes for a conducive learning environment. As parents, we are impressed by the communication we receive through the weekly E-mailed curriculum, newsletters and daily reports from their teachers. We are very happy with our decision to send our boys to Strong Start. Strong Start has exceeded our expectations and then some. Their staff is top notch — loving, caring, patient and willing to go the extra mile to meet the needs of the children (and parents). Their communication style is fantastic (not too much, not too little). They are approachable, easy to work with and our child has been thriving beyond our expectations. Thanks, Strong Start! We switched our daughter from another daycare 2 months ago and it was the best decision we could’ve made. She absolutely loves her teachers and looks forward to going to school everyday. In just two months she has made significant improvements in behavior and is learning so much. The entire staff is great! Highly recommend for anyone looking for child care! Both my boys attend Strong Start (preschool and toddler rooms). They both have varying levels of special needs and the owner, teachers and staff have given us every opportunity for careful consideration, collaboration and effort to make both of their classrooms exactly what they need to learn. The facility is immaculate and everyone is extremely kind and helpful. We couldn’t be happier as parents and my boys couldn’t be happier to attend Strong Start! It’s hard to find a real preschool curriculum that incorporates all of things we have learned about social intelligence and the importance of play that also offers full time hours. Strong Start does both! The teachers are truly amazing: smart, patient, pragmatic… the proof is that my almost three-year-old is making new friends, enjoying the creative process and comes home singing new songs, eager to tell me about his latest new adventure. We are so lucky to have found Strong Start. We have had such a great experience with Strong Start and would highly recommend to all families in the area. The facility is clean, the teachers are energetic, and the curriculum is top notch. We looked at a lot of facilities in the area, but knew Strong Start was the one from the very first moment we stepped in. Kudos to Marc and Christina for such a great establishment. We feel so fortunate to have found Strong Start for our daughter. The time and attention that the Director and staff regularly put into providing an educationally rich and positive learning environment for children is unmatched by any other childcare provider in the area. Each week there is a detailed curriculum that is implemented in the classroom and provided to the parents. 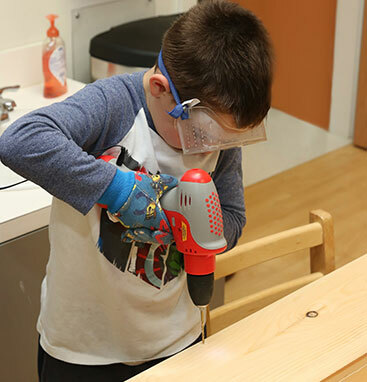 As parents who work full time, this has been a tremendous asset to us in helping to provide thoughtful and meaningful learning experiences outside of the classroom. The curriculum has provided directive and guidance to us as parents as to how we can enhance and continue to build on what our child is learning in the classroom at home. 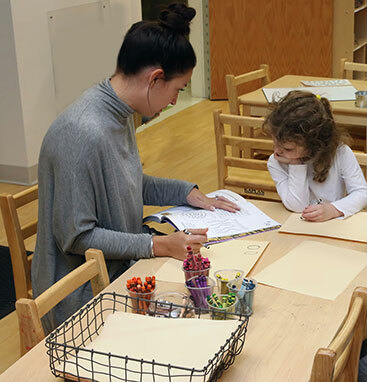 As parents you want your child exposed to as many learning opportunities as possible, and Strong Start provides more than we could have ever hoped for or expected from a childcare center. Every single day, our child is exposed to learning experiences that include: sensory, manipulation, construction, art, physical and motor play, music and movement, reading books, group activities and games, and multiple opportunities for outdoor and indoor gym play. There has not been a single day where she has not been exposed to all of the above opportunities. An example of some of those activities and experiences include: baking, water table play, artwork using various mediums, show and tell, dancing and exposure to various types of music, etc. The staff at Strong Start is educated and passionate about their work…and it shows. All of the teaching staff that I have had the opportunity to come to know have been wonderful. They are knowledgeable, enthusiastic, positive and thoughtful in the way they speak with the children…always looking for opportunities to teach them and help them grow. In addition, they regularly communicate with us about our child. They regularly share with us how our child’s day went, any needs that she may have, any funny stories and anecdotes, as well as feedback on how she is doing overall in the classroom. We couldn’t be happier with Strong Start, and rave about it whenever provided with the opportunity. We have experienced other childcare providers, and Strong Start is truly a cut above the rest. We look forward to picking up our daughter at the end of each day, because we are excited to hear about the fun activities and learning opportunities she’s participated in as well as witness her positive growth and development. We’ve had our 18-month old enrolled full-time at Strong Start for the past 5 months and we absolutely love it there. It’s clear the daily activities and lessons are thoughtfully planned out and adjusted accordingly to the children’s needs. I’ve noticed such a positive change in our daughter since she started there. I know she’s learning new things every week and it shows with her vocabulary & communication skills. They do science experiments and art projects weekly. She loves her teachers and the director Marc is always finding new ways to improve the center; it keeps getting better. We have no qualms about leaving our daughter there for 9 hours every day, she loves it. We highly recommend Strong Start and will definitely be sending future children there! Excellent school for my kids! Strong Start has been an excellent school for my kids! I have a 15 month old in the toddler room (she started in the infant room) and a 4 year old in preschool. All the teachers have been so fantastic and supportive of the kids emotional, physical and cognitive develop. They have a great way of communicating with parents daily about the curriculum and what happened while they were at school. I always feel comfortable approaching the staff with questions and they really take care to see to the needs of each child. My children have learned and grown so much, but they are also so happy to be at school. It has been a wonderful place for our whole family. Strong Start is an outstanding preschool/daycare! Strong Start is an outstanding preschool/daycare! My 3yo daughter transitioned easily to this new school when we recently moved to Trumbull. We love the “inquiry-based” learning curriculum where creativity, movement and hands-on learning is encouraged. My daughter is very happy at Strong Start and she comes home singing new songs and talking excitedly about her experiences at school every day. She has learned to “Be Safe, Be Kind and Be Responsible”… lessons that we should all be reminded of daily. Marc Hoffman and his staff are wonderful and they are extremely committed to providing children with an extraordinary early education experience. I highly recommend this program!!! My boys have grown so much since attending Strong Start. My boys have grown so much since attending Strong Start. I can only thank the amazing staff for their diligent work. The curriculum has introduced my boys to fun, structure and the ability to grow into independent children that thrive in all environments. The facility is beautiful, clean and inspires clarity and focus to learn. I thank Marc, Christina and all of the staff for providing my children this experience that will help them explore who they are and guide them to be the best they can be. I am so lucky and happy to have found Strong Start!! My son started there when he was a year old and has been there for 8 months now. I absolutely love everything about it. The director and assistant director are very easy to get in touch with and answer any questions or concerns that I have right away. I have even emailed the director over the weekend and gotten a quick response. My son has grown so much since he has started and is always so excited when we drive up for drop off and sometimes doesn’t want to leave! He has made great friends! The facility itself is extremely clean, organized, and laid out very well. They have classrooms broken up by age with age-appropriate toys/activities. There are two outdoor play areas as well AND an indoor gym, so there are lots of places for the kids to play and have fun as well as their classroom for learning experiences (and more play). I also love the hours (6:30-6:30), which allow for early drop off which is something I needed with my work schedule. I highly recommend Strong Start to anyone looking for a clean, safe, and nurturing environment for their child to grow in! 5 stars, 2 thumbs up, zero doubt! A little over a month ago our son (19 months) started at Strong Start and we could not be more satisfied!! From the moment we first entered the building we were greeted with professionalism, warmth, and an all-around feeling of peace of mind. Every day he comes home with a new set of skills, and happily uses them while playing in the yard or in his playroom. For example last week we witnessed him digging tiny holes and putting acorns in them, which is was he did in class with some flower seeds. We were watching him speechless since he himself found what he needed in order to fulfill his plan of planting! He is more curious than ever, engaged in play and investigations, and simply is a happy little boy, developing his critical thinking skills more and more each day. As first time parents we had no idea how big the differences between daycare centers can be… Even though to us the term “day care” seems to be an understatement and incorrect choice of words which does not describe Strong Start accordingly in a way it is deserves it. It is new, bright, CLEAN and SAFE. A Strong Start is excellent day care center. Deciding to put my 10 months old son in day care was hard decision, but all my first time mother worries were put at ease by GREAT TEAM working there. Teachers are amazing and genuinely care for the kids. Founder- Marc and Educational Director – Christina are always on site, know every child and parent and are hands on with the children. They are happy to help, answer any questions and willing to work with me if I have any special requests. They are truly like family and I could not be happier with their care. It’s really worth mentioning Strong Start facility. It is new, bright, CLEAN and SAFE. I’m big fan of center’s indoor gym; I’ve never seen such in any other day care center that I’ve visited. I would definitely recommend Strong Start to any new parent. An amazing facility with an experienced and loving staff! My two children have attended Strong Start for about a year and it has been such a great place for us as a family. My children have gone through the infant, toddler, Twos and Pre-K programs and at each level they are met with great teachers and challenging but fun curriculum. The staff guided my son through the transition of a new house, new school and potty training all at once. As I worried about him with so much change in his life, they really helped him thrive. Now in the Pre-K and toddler programs both my children are learning new things every day and their strong curiosity about the world is really shaped by the learning style at Strong Start. If you are considering a daycare in the Trumbull area, you need to visit Strong Start and meet the amazing staff! From the day I dropped off my four month old in the infant room this past January, I have felt an extreme sense of comfort knowing that he is in great hands. My son loves his teachers and playing with his classmates. He is growing so much from his daily interactions, that it feels like every day he has learned something new. I credit the amazing staff at Strong Start for always going above and beyond to ensure that our children are receiving the best care and getting the most out of their day. As a new parent, the sense of relief is overwhelming and I couldn’t be happier sending my little guy here! I cannot say enough good things about Strong Start!! I cannot say enough good things about Strong Start!! I started my two boys back in October and I wish I had started them sooner. The teachers and the directors are phenomenal and I know they truly have the kids best interest at heart. The unique curriculum and philosophy of the school is evident in everything they do – I’ve seen my almost three year old make vast improvements in the short 5 months that he has been there from a developmental perspective. And the teachers did an amazing job in making his transition from another school a smooth one! My 8 month old loves all the interactive activities they do in the newborn room too. I know both boys are in great hands – learning and being cared for by the best teachers. I couldn’t be happier with Strong Start! Strong Start is a major part of my 2 year olds life, as she is under the amazing staffs supervision for almost 30 hours a week. I trust each one of them entirely and have been amazed countless times by what my young child has learned in less than a year. Most daycare facilities are just that…a”day care”. Marc, Christina and the teachers at Strong Start are nothing less than exceptional! We found this daycare by chance and took a tour on a Saturday. The Director Marc was VERY accommodating. My son who started at 15 months (is now 20 months) absolutely loves it there. Drop offs are easy and pick ups are so hard. It literally takes around 20 mins to get him to leave every night. I adore his teachers and they have open lines of communication with me whenever I need. Every one is easy to talk to should any issues arise. Very happy with our decision to send our son there. He is learning and happy!! I can second the fact that it is easier to drop off, than it is to pick up! My child normally requires a minimum 5-15 minute cool down. The school, administrators, and staff are Phenomenal. I am noticing my daughters critical thinking skills take off. I’m even more surprised by the fact that she is anxious to demonstrate her newly learned skills at home (songs, phrases, activities). The facility is new, top notch, safe, clean, modern and designed efficiently. I simply have nothing negative to say, which is truly a relief. Strong Start Early Care, is a nurturing environment that I would recommend to any parent, wanting to give their child a foundation of, ‘learning how to learn’ at an early age. I have peace of mind and feel fortunate throughout the day knowing my child is in great care. What an excellent child care and education community! What an excellent child care and education community! When we decided to transition our 2 ½ year old son from being at home with a baby sitter, to a structured learning environment, we were more than a bit nervous to say the least, especially as first time parents. But having witnessed his continued growth this past year, and seeing him lose that shyness and form bonds with his peers and the wonderful teachers at Strong Start, it has been a joy to witness. Owner Mark Hoffman is always present is very hands on. Together with his friendly, experienced and committed staff, they have made my son feel safe and secure. The facilities are new and state-of-the-art in its design and purpose. The security systems and protocols in place are also state-of-the art, and added bonus is more than adequate parking. The curriculum is structured in a fun way that encourages kids to explore and be creative, and to think independently and to work in teams. My son loves going to school and his happiness has assured us that we’ve made the best choice for him. I would recommend this facility without hesitation! I am a very particular person when it comes to my children, there are not many daycares in the area that where clean, organized and fair when it comes to cost that I felt that I could trust with my child. Strong Starts staff is very approachable, knowledgeable and friendly. I have had a wonderful experience so far. I have and would recommend them highly. I highly recommend Strong Start. My son loves this place and we have been here since it open last year.